Foreword by Brian C. Betner, Esq. From increasing healthcare delivery and payment models to rapid-fire advances in telemedicine, credentialing software, and other game-changing technologies, today’s MSPs and medical staff leaders face continual evolution in their field. To meet the demands of an industry on the move, traditional credentialing approaches and medical staff makeups must evolve as well—a task that requires strategic intervention and broad buy-in. 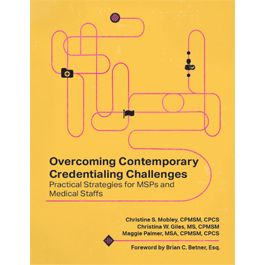 Featuring fresh insight from three authors with wide-ranging expertise, Overcoming Contemporary Credentialing Challenges: Practical Strategies for MSPs and Medical Staffs provides actionable guidance for contending with the culprits behind 10 of today’s top practitioner vetting pitfalls. Deepen your proficiency in key credentialing functions. Each chapter dives deep into a contemporary pain point, presenting a reader-friendly flow of specific challenges, targeted interventions, and practical tools that readily translate from page to practice. Make meaningful change in the credentialing trenches. Dozens of case studies, governing documents, credentialing checklists, and evaluative grids illustrate and enable real-world application of presented strategies. Plus, readers can download customizable versions of featured forms and bonus tools online. Keep pace in a rapidly evolving credentialing climate. Learn from a team of expert authors with specialized knowledge in the industry-shaping trends of today and tomorrow, including delegated credentialing, provider enrollment, and the influx of privileged nonphysician practitioners. Christine S. Mobley, CPMSM, CPCS, is a consultant, author, and educator specializing in risk assessment, program development, project management, and redesign in the areas of credentialing services, privileging, medical staff governance, accreditation compliance, and personnel staffing. She has more than 30 years of combined experience in consulting and education and previously served in hospital medical staff services positions. Christina Giles, MS, CPMSM, has been a consultant and speaker for more than 30 years. She specializes in education/training of credentialing personnel; orientation/training of medical staff leaders and MSPs; administrative functions such as accreditation survey preparation, credentialing, privileging, and peer review; and assessment and development of medical staff governance documents, policies, and procedures. Giles serves as an advisor to multiple medical staff publications. She is a co-author and editor of The Medical Staff Services Handbook: Fundamentals and Beyond and co-author of Health Care Credentialing: A Guide to Practical Innovations. She has presented nationally on multiple topics, including accreditation preparation, credentialing, privileging, and medical services management. Maggie Palmer, MSA, CPMSM, CPCS, vice president of operations, North America at IntelliCentrics, Inc.
Maggie Palmer, MSA, CPMSM, CPCS, is a healthcare administration professional with many years of experience in medical staff services, quality improvement, risk management, and consulting, as well as other administrative areas of healthcare. Palmer holds a master’s degree in healthcare administration from Central Michigan University. She has been dual-certified in her field through the National Association Medical Staff Services (NAMSS) since 2000; she currently holds both the CPCS and the CPMSM designations. Palmer was also a fellow in the American College of Healthcare Executives (ACHE). She is currently Vice President of Operations, North America for IntelliCentrics, Inc., as well as a medical staff administration consultant and instructor/speaker. Her previous experience includes national director of credentialing for Tenet Health in Dallas; director at Scripps Health in San Diego; executive director of Hawaii Credential Verification Service; and credentials specialist at Castle Medical Center and at Straub Clinic and Hospital. Palmer currently serves as faculty for NAMSS, is a member of the Credentialing Resource Center’s News, Analysis, and Education Board, and is a member of the National Credentialing Forum. She also served as the president of the California Association Medical Staff Services, the bylaws chair for NAMSS, and a board member of the Hawaii Association of Medical Service Professionals. Brian C. Betner, Esq., shareholder at Hall, Render, Killian, Heath & Lyman, P.C. Brian C. Betner, Esq., is a shareholder at Hall, Render, Killian, Heath & Lyman, P.C., where he focuses his practice on the representation of health systems, hospitals, and other healthcare providers in a broad range of regulatory, operational, and strategic matters. These include an emphasis on physician alignment; clinically integrated arrangements; fraud and abuse compliance counseling including Office of Inspector General/Centers for Medicare & Medicaid Services self-disclosure representation; and medical staff governance, credentialing, and peer review issues. Betner recently completed his term as Vice Chair of the Medical Staff, Credentialing, and Peer Review Practice Group of the American Health Lawyers Association, the nation's largest organization dedicated to legal issues in the healthcare industry. —Brian C. Betner, Esq., shareholder, Hall, Render, Killian, Heath & Lyman, P.C. Chapter 3: Advanced Practice Clinicians: Who Are They and What Do We Do With Them? Chapter 10: The Quagmire of Delegation: To Whom, From Whom, and Under What Conditions?